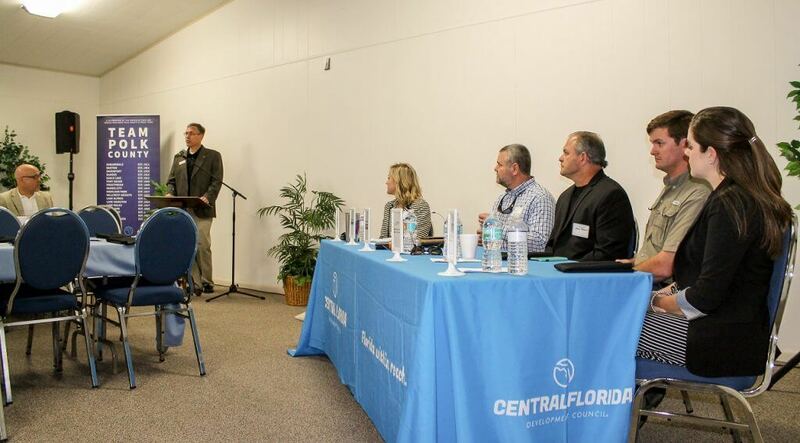 In Polk County, the agriculture industry remains one of our most important economic drivers. To highlight this valuable industry, business and community leaders gathered at the Central Florida Development Council’s Agriculture Industry Breakfast to discuss the promising future of agriculture. During the breakfast, a panel of industry experts answered key questions and discussed future trends. The event was held at the Polk County Farm Bureau in Bartow. The panel discussion, which was moderated by Callie Neslund of The Mosaic Company, included a four-member group – each representing a different facet of the industry. Steve Maxwell, of Highland Precision Ag, spoke to the importance of agri-technology and advancing the farm’s efficiency, environmental stewardship, and productivity while maintaining regulatory compliance. Christian Spinosa, of Dudley Putnam, Inc., offered perspective from a young farmer and rancher’s point of view, as well as spoke with authority on the state of the beef industry. Scarlett Jackson with Warner University drew a detailed picture of the challenges and recent successes in answering the demand for a younger, educated workforce in the industry. Steven Callaham, of the Dundee Citrus Growers Association, contributed valuable insight on the citrus industry, as well as other valuable commodities and alternative crops. In discussing the current state of the industry, panelists highlighted new innovations including precision farming techniques and alternative crops suitable for our region. Some farmers have been experimenting with peaches, pomegranates, eucalyptus, olives, hops, and even bamboo.